Very sensitive by nature, you prefer to be in your own familiar surroundings. Cautious and conservative, you make changes in your life only very slowly, if at all. You do not open up easily to strangers. Friendships are made for life, however — once given, your trust is forever. Your mother, your home as a child and your early family life in general are very important to you. You are also very sentimental. When you feel self- confident, you are gentle, giving and protective of the needs of others. But when you feel insecure or threatened, you become overly sensitive to criticism, shy, withdrawn and moody. You have a strong need for security — in the sense that you are being loved, nourished and protected. Sun is in 04 Degrees Taurus. Moon is in 02 Degrees Gemini. Restless in the extreme, you are easily bored because of your short attention span. Your emotions change rapidly and you love to talk about your feelings. Generally, you have good judgment — your intellect controls your emotions and you do not overreact emotionally to things. A good jack-of-all-trades, you have many- sided interests and enjoy reasoning things through. With your mental agility and need for physical mobility, you are attracted to traveling and learning about other peoples and cultures. You have vivid powers of emotional self-expression – – you can be a nonstop talker. You love to share your ideas with anyone who will listen. 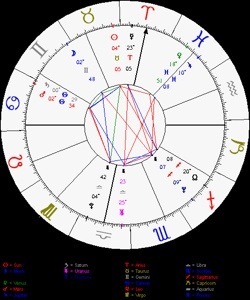 Mercury is in 23 Degrees Aries. Venus is in 18 Degrees Pisces. Mars is in 02 Degrees Cancer. Jupiter is in 10 Degrees Pisces. The most important issue for you is emotional security. You have a deep and gnawing fear that those on whom you depend for emotional support will prove to be unreliable in the long run. When you are unloved and insecure, you distrust others and tend to feel isolated and lonely. Very cool, detached and objective, you can be counted on — in situations that are inherently stressful or full of tension — not to lose your self- control. That is a great and welcome gift at such times. You will probably have many different contacts and acquaintances throughout your life. You’re quite gregarious by nature and your natural curiosity about others lets you take the lead in forming new relationships. You’ll form close ties with those who have similarly idealistic ideas — especially those who can stimulate you intellectually in your chosen field of interest. Your enthusiasm for learning new things may also cause you to do quite a bit of traveling. Because you probably will have many wide-ranging interests and concerns, you most likely will have contacts and connections in various parts of the country (or world).